A long-time veteran of the North American League of Legends scene, Yiliang “Doublelift” Peng wrote at the start of this year that one of his goals was to beat his former teammates on Team SoloMid. He didn’t have to wait long. The 2018 North American League Championship Series started with a hyped-up grudge match between Team SoloMid and Team Liquid, who had picked up Doublelift after he was unceremoniously booted from TSM. On a new squad, a stacked Team Liquid roster, Doublelift would have his chance to prove he was better than the European-import duo that replaced him. And over the course of 27 minutes and change, he did just that. The first big hit came 13 minutes into the game, where after a scrap in the jungle, both teams went their separate ways. Zven and Mithy, the new-look TSM duo, went back to business-as-usual in the lane, but Liquid was keeping tabs. Significant abilities with long cooldowns that could help the TSM duo shrug off aggression weren’t available, and Doublelift and co. leaped at the chance to do some damage. A fight in the middle lane during a massive push went poorly for TSM as well. Where Liquid looked organized, transferring aggression on the map from one side to another, TSM was starting to look reactionary and cautious. A breakdown of communication led to TSM’s new jungler Mike “MikeYeung” Yeung getting picked off, leaving the door open for Liquid to do even more damage and surge further ahead. By the time Liquid was busting down the door, the conclusion was inevitable. There wasn’t any way for TSM to wrest control of the game away, and Liquid took the North American League opener. In a post-game interview, Doublelift was asked if it helped that a charity wager made before the game, between the two team’s owners, meant his former boss Andy Dinh of TSM would have to donate $15,000 to Liquid’s charity of choice, City Year LA. “It adds icing on the cake,” he replied. As for their match tomorrow, against OpTic Gaming? 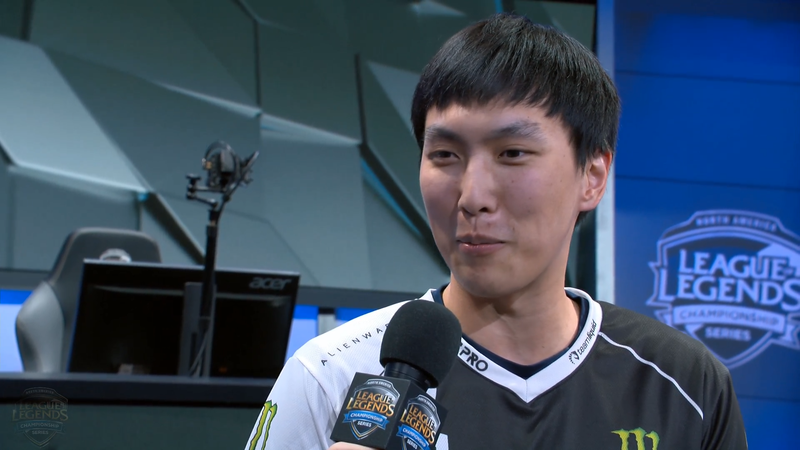 “I actually don’t even really know who’s on OpTic,” said Doublelift.